This Vegan Carrot Halva is based on a popular Indian dessert called gajar ka halwa. This Vegan Carrot Halva resembles a sweet rice pudding or rice porridge but it is made with carrots instead of rice. For this carrot porridge, grated carrots are cooked very slowly, until you get a mushy, porridge-like consistency. Carrot halva is traditionally made with milk, ghee and cream. For my Vegan Carrot Halva I have used coconut rice milk and coconut oil instead of dairy. I love cooking my porridges in coconut rice milk as it adds a lovely sweetness. I love the sweetness of the slow cooked carrots combined with the nutty almond flour, caramelly coconut sugar, the succulent raisins and a just a little hint of coconut. It tastes quite similar to a good carrot cake and tastes absolutely amazing served warm with a generous scoop of ice-cream and some roasted almonds and coconut flakes on top. Add the coconut palm sugar and simmer for 20 minutes, stirring frequently and making sure it doesn’t burn. Add the almond flour, coconut oil, raisins and cardamom and allow to cook for 5 more minutes. The carrot porridge should be quite thick. 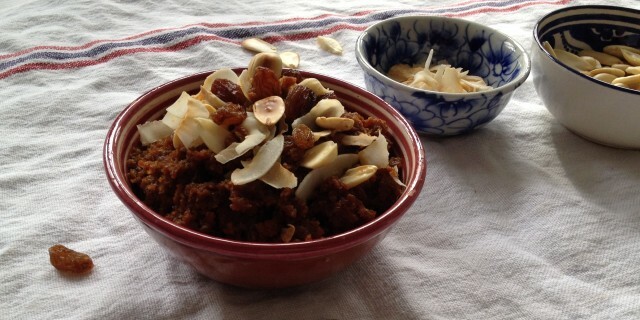 Serve warm with roasted almonds and coconut flakes. You can also add a scoop of coconut ice cream or yoghurt if you like.